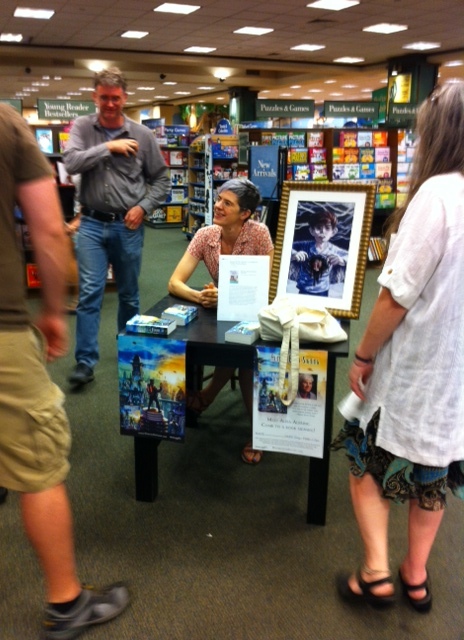 This past Saturday, I had my first-ever solo book signing, at the Barnes & Noble in Bloomington, IN. I admit, I was a bit nervous beforehand, but everything went well. I even sold out of books! One of my friends (who shall remain nameless) asked for a message customized to his personality. Which led me to Bill Ryan’s blog, Insulted by Authors. I’m too squeamish to insult as well as either of the Sedaris siblings (see blog), but with a little help from this, I think I did alright. Categories: Writers of the Future | Tags: Alisa Alering, Barnes & Noble, Book signing, Insults, Writers of the Future | Permalink.